Format partitions in GPT format if you need replication while attaching storage in both nodes iSCSI initiator. Install Windows Server and allow SQL ports in windows firewall or disable firewall on both physical machines/VMs. 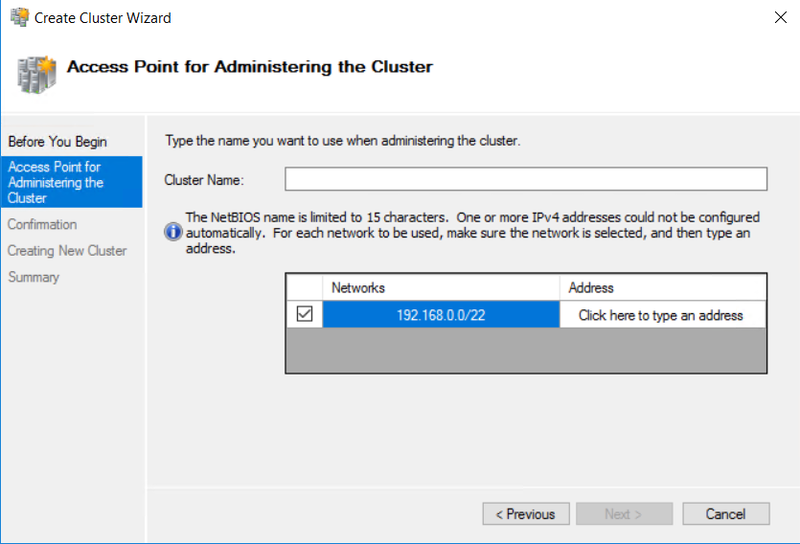 Install Failover Clustering, Multipath I/O and .Net Framework 3.5 features, Hyper-V on both SQL Servers Nodes from Server Manager console. # This Script creates 4 Virtual NICs for Domain iSCSI Cluster and Live Migration. Create and configure High Available Storage depends on your environment. 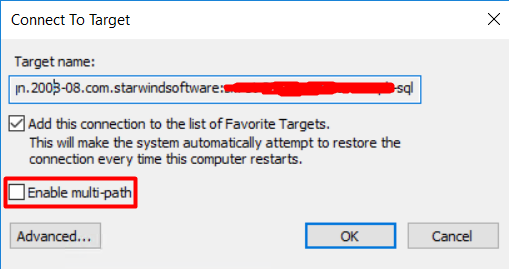 I am using Starwind Virtual SAN to create storage. 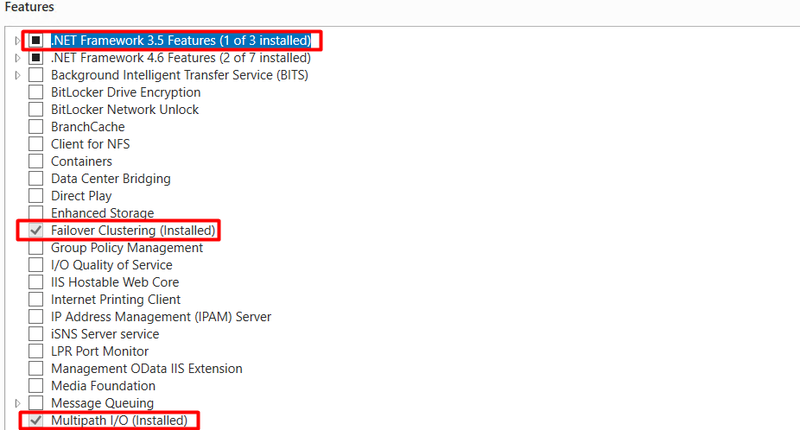 Open MPIO Properties from installed feature in Server Manager console. Select “Add support for iSCSI devices" then press add button and restart server as the popup will appear to restart machine to take effect. Do repeat same process in other machine. After restarting both machines go to server Manager and select iSCSI initiator and discovering iSCSI target and add disks to both nodes. 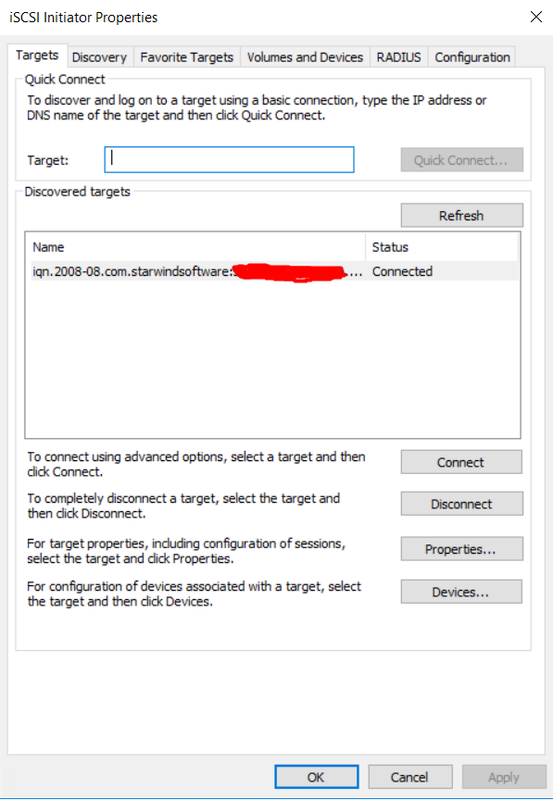 To do this put IP address in Target and press Quick Connect button to get connected with Storage server. The Name will be displayed under discovered targets with status. Disconnect once the target and connect button again to enable multi-path option. Below mentioned is the snapshot to enable multi-path. Go to Disk Management and you can find the Disks will appear which we configured in SAN settings in above section. Bring both disks online and initialize disks with MBR/GPT partition style as per your requirement. 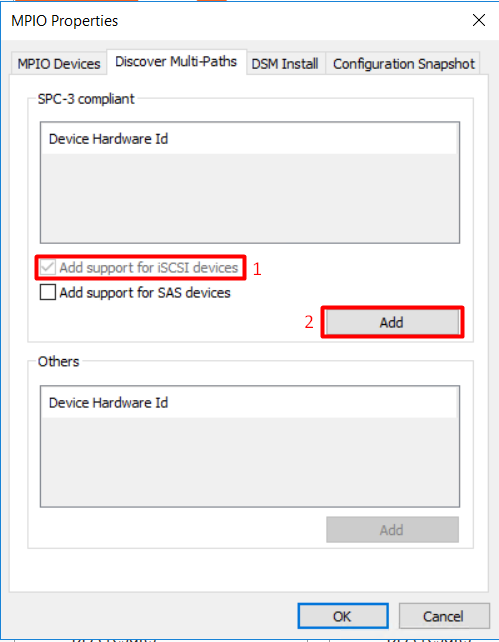 Create simple volume for both disks and assign drive letter. For best practice change the drive letter of CD-ROM and assigned both drive letters in sequence in both machines so that there will be no manipulation at later stage. Please note If you want replication in SQL Clustering then you must format partitions in GPT style. Repeat Step 6 in 2nd machine until enable multi-path option and you will find both drives in Disk Management. Assign same drive letters as you assigned in 1st machine. 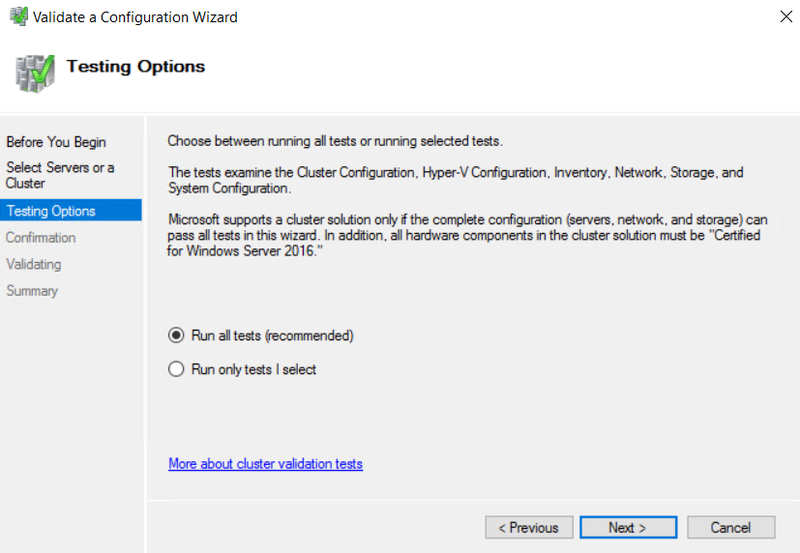 Create windows failover cluster and modify cluster disk and network settings in Validation configurations. 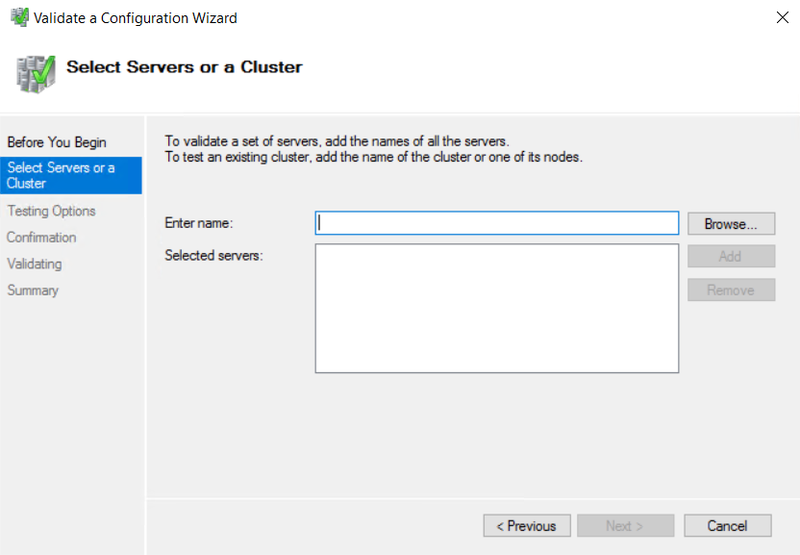 Open Failover Cluster Manager from Server Manager and select Validate Configuration to run Wizard. Click on browse and enter the name of both SQL nodes to run Test for both nodes. 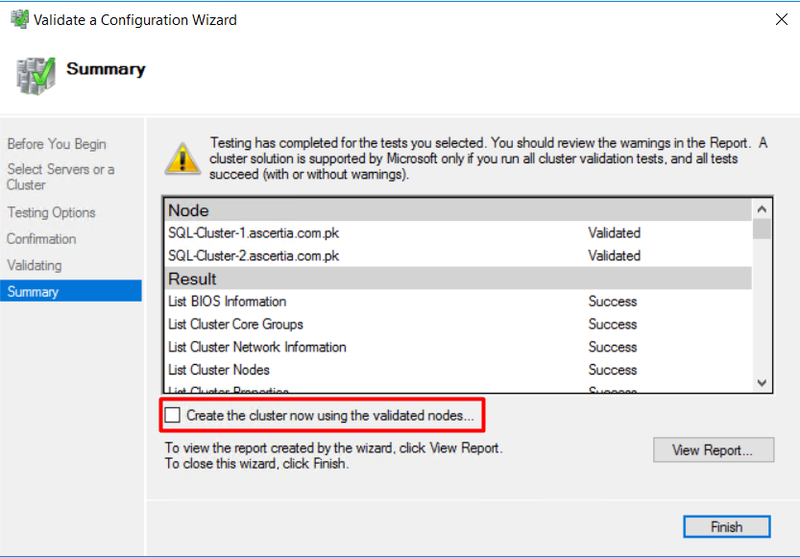 After run all test and get the summary page, you must select “Create the cluster now using the validated nodes…" option and click on finish. 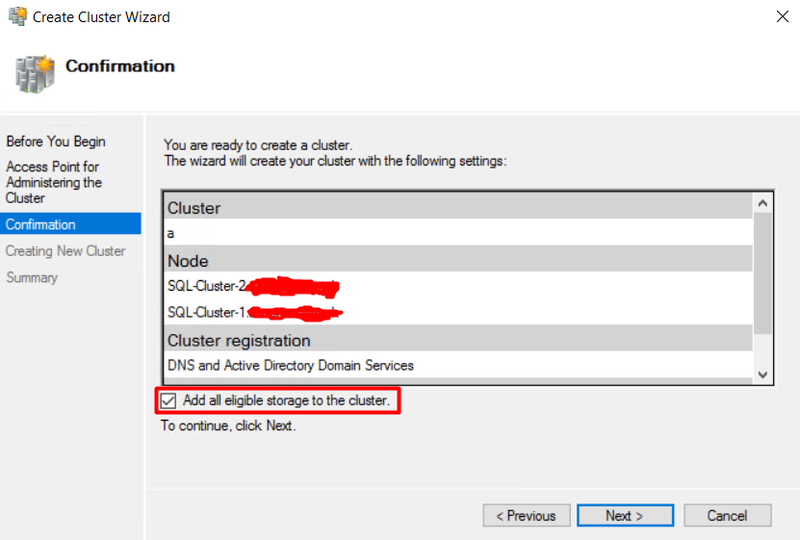 You must select “Add all eligible storage to the cluster." Option and press next. After this wizard will run the deployment process and will take approximately 5 minutes to finish depend on your network and machines performance. Install SQL Server 2016 failover cluster on SQL Node1 by selecting New SQL Server failover cluster installation option from SQL Server installation Center. 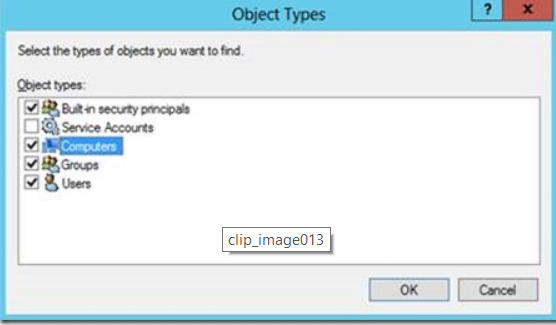 – Ensure that you are logged in as a user that has permissions to create computer objects in the domain. 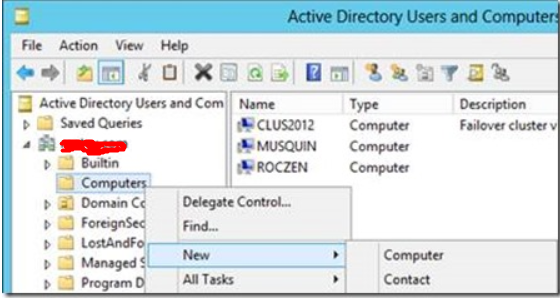 – Open the Active Directory Users and Computers Snap-in (dsa.msc). – Select View -> Advanced Features. – Right click the OU/Container you want the VCO to reside in and click “New" -> “Computer"
– Enter the CNO (Make sure to select “Computers" option in the “Object Types" window) and click “OK". 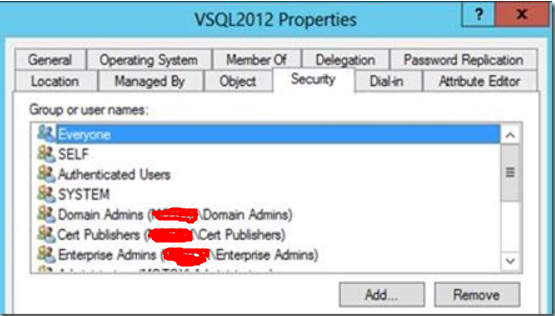 – Highlight the CNO, check the following permissions, and click “OK". 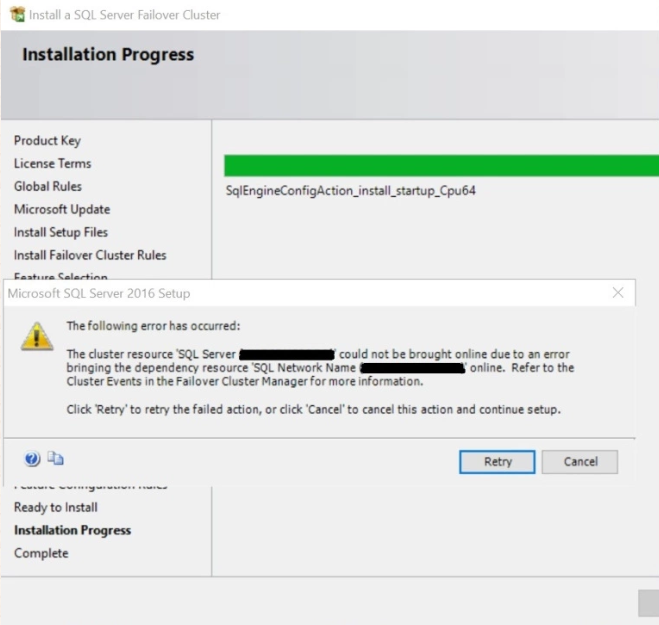 – Press retry button in Installation of SQL Server and the Network Name resource should start without issue. 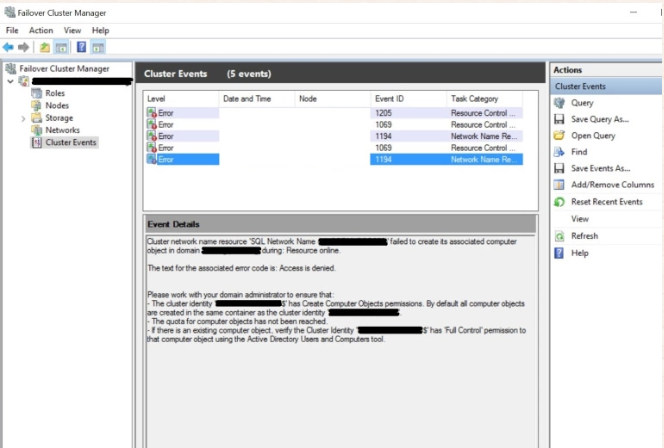 Open failover cluster manager and verify under SQL cluster Role that owner node must be the SQL-node 1 where we installed SQL Server with the status Running. 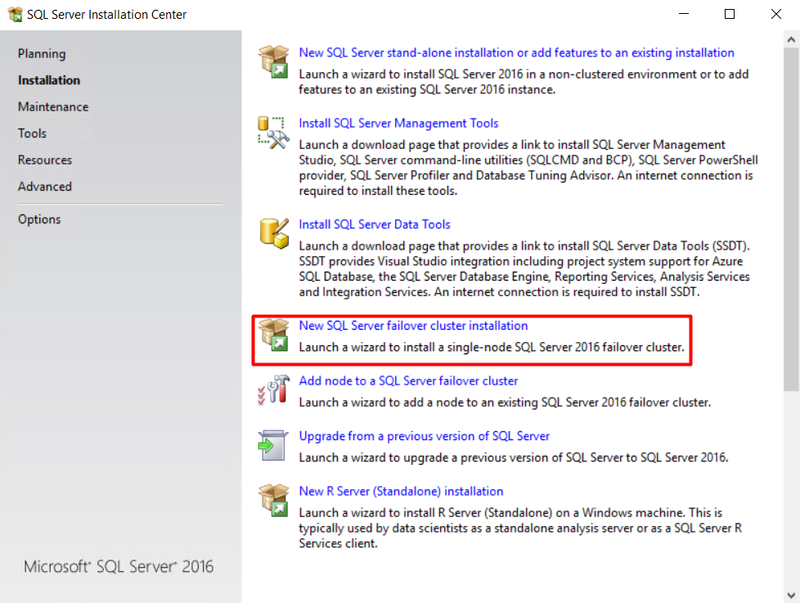 Add Node of SQL Server 2016 cluster in 2nd machine by selecting Add node to a SQL Server failover cluster option from SQL Server installation Center. 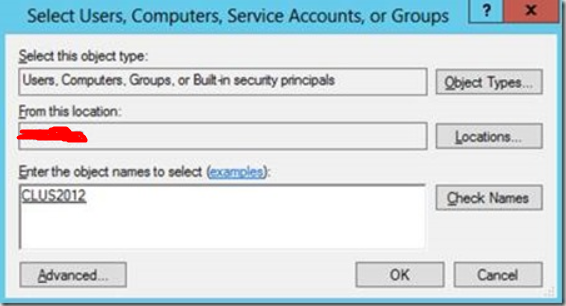 Provide Service accounts password here as setup will not allow you to change account and services startup type. After 5-8 Seconds, you will find that the Owner Node is being shifted to Node 2.